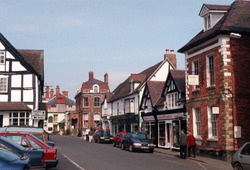 Church Stretton is an historic Market Town situated in the heart of the South Shropshire hills on the English/Welsh border known as The Marches. It is the only town in the Shropshire Hills Area of Outstanding Natural Beauty. The area is renowned worldwide for its geology, with some of the oldest rock formations in existence. Church Stretton is set within a landscape of stunning variety and beauty. The local Walkers Are Welcome committee has produced booklets of four illustrated safe way-marked walks of between 2 and 10 mile lengths that follow well maintained grassy paths through woodlands and over parts of the magnificent hills: the booklets are readily available from outlets in town. Cardingmill Valley and the Long Mynd are a magnet for walkers of all ages and abilities. On offer are ambles, Walking for Health paths, more active rambles and the opportunity to walk the hill tops or join the annual 50-mile Long Mynd Hike, or the even longer Shropshire Way or Offa’s Dyke with surprisingly modest effort. There are over 30 miles of well-maintained footpaths and 20 miles of bridleways that run through the heather of the moorlands, the grass, bracken and woods of the Shropshire Hills and the lush greenery of the batches and lowland fields. After your walk return to the Baron for a well deserved pint of local ale and a warm by the log fire, then a nap on our 2,000 sprung pocket bed to power up for a delicious home cooked meal and a chat with our locals. The Long Mynd, rising above the west of Church Stretton, is renowned for walking, mountain biking, gliding, hang gliding and paragliding, and boasts the second highest golf course in England. The beautiful countryside, with its wild uplands and breathtaking views, features prominently in the books of Mary Webb, A E Housman, and Malcolm Saville.